Roubai no sato (ろうばいの郷) is the garden where you can enjoy "Robai (Wintersweet)" located in Annaka, Gunma. It was opened about 30 years ago and planted 12,000 Robai trees in this garden. Robai blossom in January to early February. Robai has not only great yellow color, but also enjoy great smell of sweet. Parking is free. 300 yen for admission. Open: 12/21 to end of Feb.
Robai no Sato "Wintersweet village" is the flower garden located in Annaka, Gunma. There are 12,000 Wintersweets in this garden. 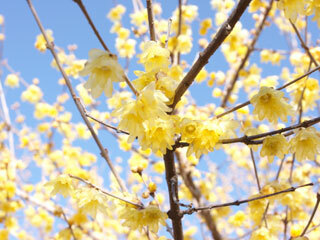 On the End of December to beginning of February, you can enjoy great blossom of Wintersweet. There is resting area where you can eat great food, and buy flash vegetable which made in Annnaka. All of them are very reasonable price. Udon they offer is very delicious. Robai "Wintersweet" come from China in 17th century. Robai means candle plum, named because the color looks like candle art. It has sweet smell and used for perfume and other cosmetic stuff.